D o you have what it takes to be a future U.S. Paralympic medalist? Here’s your chance to find out. Athletes with physical and visual disabilities can test their skills in two sporting events tailored to introduce participants to adaptive sports and to identify the next generation of U.S. Paralympic hopefuls. Research shows that daily physical activity enhances not only an individual's self-esteem and peer relationships, but also results in increased achievement and better health, enabling a higher quality of life. However, despite these findings, most individuals with Paralympic-eligible impairments do not have the opportunity to participate in any regular sports activity. U.S. Paralympics, a division of the nonprofit United States Olympics Committee, introduced Gateway to Gold in 2013. Gateway to Gold is a nationwide talent identification and development program that introduces Americans with physical and visual disabilities to Paralympic sport and leads them to the athlete pipeline for the U.S. Paralympic Team. Locally, Harris County-Houston Sports Authority is hosting Houston’s Gateway to Gold events with the two-fold objective (1) to introduce youth, adults and military veterans to Paralympic sports, and (2) to identity prospective athletes who are ready for the next level of opportunity in Paralympic sport. Grassroots Paralympic sports programs are vital to the Paralympic Movement. The first opportunity for individuals to participate in a sport program is predominately community-based and can provide opportunities to participate and compete across a range of skill levels from introductory and recreational to masters and lifestyle. Houston will host an introduction to adaptive sport event designed to help identify emerging athletes who can take part in local events and competitions. Participants will get a chance to try out several Paralympic sports. Local Paralympic sport clubs will be hosting demonstrations of these sports and attendees will be able to meet the athletes and participate in friendly competitions. Local Paralympic sport clubs will also be available to connect participants to ongoing sport programs and facilities in the Houston area to promote sustained physical activity and participation in sport. 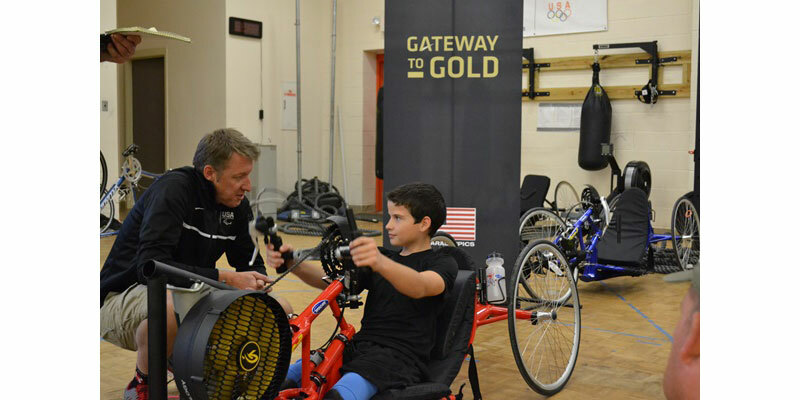 Gateway to Gold Performance is designed to test sport skills and help build the athlete pipeline for the U.S. Paralympic Team and is geared toward a current adaptive sport participant. At the event, prospective athletes will be tested on a variety of skills and evaluations that can help determine if they are ready for the next level of opportunity in Paralympic sport and identify potential future U.S. Paralympic athletes. Participants with specific skills will be able to continue their development with local area coaching and training with the potential to progress into U.S. Paralympic athlete pipeline. Ongoing local programs are the cornerstone to support this Gateway to Gold strategy. Harris County-Houston Sports Authority is partnering with local to Paralympic Sport Clubs and adaptive sport facilities and organizations to provide continual resources to the local community. Together, these community partners encourage athletes with physical and visual disabilities to participate in daily physical activity through participant recruiting, hosting camps, clinics, competitions, coaching and coordinating events that align with existing programs in the area. Get the ball rolling and register for Gateway to Gold Performance! If you are an athlete and have questions about participating in the event, please contact Cindy Berkman via email at cberkman@houstonsports.org or call 713-308-5906. To discover other Gateway to Gold opportunities across the country, find out when the next Talent Identification Day is taking place near you. A sports enthusiast, Cindy Berkman spearheads the Gateway to Gold Programming for the Harris County-Houston Sports Authority.